This important Venetian monument was a single-aisled, wooden-roofed basilica with certain parts of the church, (specifically: the floor, the windows, and the main door), being of a later date. Its interior reveals such detail and precision in workmanship that it is undoubtedly that of master craftsmen. 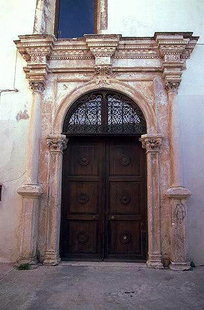 The impressive ornate northern doorway displays these skills; however, the church is closed for renovations.